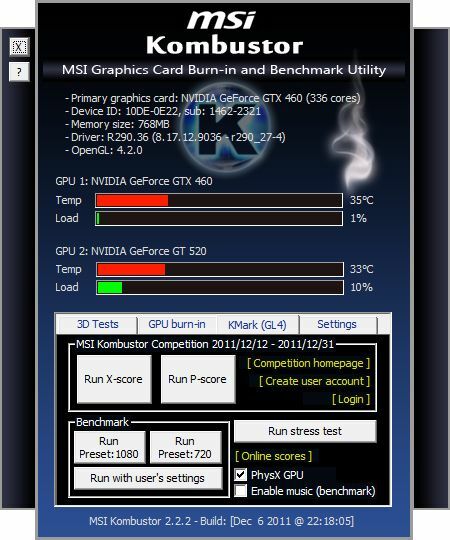 A new update of Kombustor, MSI’s GPU stress test and graphics card benchmarking tool (for NVIDIA GeForce and AMD Radeon), is available. You can post your feedbacks or bug reports in the following places: Afterburner forum, oZone3D.Net GPU tools forum or in the comments section of this article. Main new changes in Kombustor 2.2.2 are related to MSI Kombustor Competition (from December 12, 2011 to December 31, 2011). MSI Kombustor Competition is based on the KMark benchmark and then the changes are essentially focused on KMark. KMark is an OpenGL 4 and PhysX benchmark (more details about KMark HERE). The competition is limited to OpenGL 4 / DX11 capable graphics cards: NVIDIA GeForce 400 / 500 series and AMD Radeon HD 5000 / 6000 series. First thing, users have to create a login to submit a score for the competition. The link to create an account is only available in Kombustor (Create account in Kmark panel and and score dialog box). But of course, people can simply submit like in previous versions: it’s the anonymous mode (or half-anonymous mode if the user enter a nickname). But in order to participate to the Kombustor competition and have the score displayed on MSI Kombustor competition homepage, users must submit with a login. P-score: performance mode, 1280×720 fullscreen, with reasonable graphics and PhysX workload. X-score: extreme mode, 1920×1080 fullscreen, with more graphics and PhysX workload. MSI Kombustor Competition includes two contests: the Warm Up and the Precision Challenge. For the Warm Up, just submit a X-score or a P-score, that’s all. Every week, MSI will select some users (don’t ask me how, I don’t know) for receiving the prizes. The Precision Challenge is more interesting. The goal of the Precision Challenge is to reach a target score. Like for the Warm Up, just submit a X-score or a P-score (actually when you submit a score, you participate to both competitions). The first competitors reaching the target scores win the prizes. To reach the target score, you must use MSI Afterburner to overclock or underclock your graphics card. In a word, you have to master your hardware to reach the score. More information about the competition rules is available HERE. 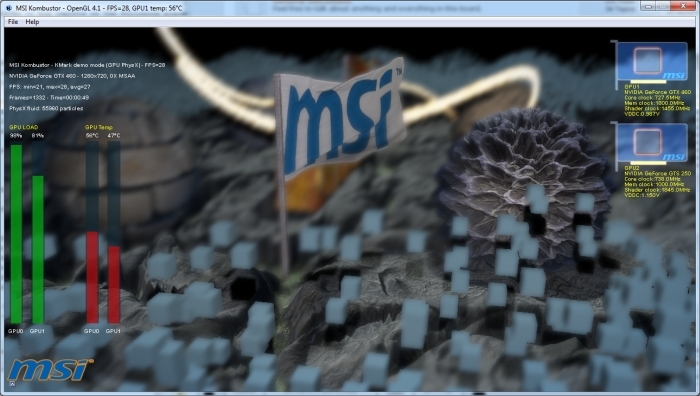 Update: compiled with latest ZoomGPU 1.6.1 (support of GeForce GTX 560 Ti 448 cores). New: added score submission with account. 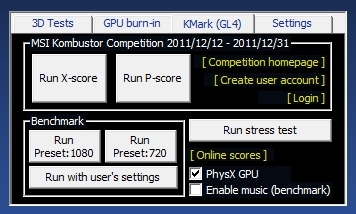 New: added a new settings in KMark benchmark for the Dec 2011 competition. In this setting, PhysX and 3D are in the same thread and built-in multicore PhysX is enabled. Changed: in KMark benchmark, PhysX CPU checkbox changed in PhysX GPU checkbox. Who is it BloodShed ? I created an account on oZone3D.Net and entered my login info into the dialog box on Kombustor after a test, hit the submit button and it went…somewhere…as “anonymous” I guess. But it didn’t show up in the contest list or even in my oZone3D account. The nickname login box on Kombustor won’t take any text at all. Am I the only one experiencing this? What am I doing wrong? @FreeJet: your account is correctly created and activated. So you should have no problem to submit scores. Try again and let me know. Then I click submit and tells me it was sent correctly but when I click to see the online result is displayed as anonymous! Why is the program detecting my intel gpu ? It’s not detecting the nvidia card. I tried selecting it manually to run with the nvidia card, but it still shows intel.